Three Irish albums that recently hit the shelves – two debuts and one re-release – demonstrate that the Irish rock scene is alive and kicking, and as vibrant as it was four decades ago. The Plea are an Irish Indie/Rock band from Ballyliffin, Co Donegal. The quartet consists of two brothers, Denny Doherty (vocals, guitar, piano) and Dermot Doherty (guitar), along with Paul Toland (bass) and Gerry Strawbridge (drums). Their debut album, ‘The Dreamers Stadium’, has loud rampant songs like ‘Staggers Anthem’ and ‘Oh Ah Yay’, but it also has soft intervals like ‘Glass Waltz’. It’s obvious someone ‘up there’ likes them, because they went from a small band that no one heard of to starring on the second biggest stage at Oxegen, and they also appeared for Ash during their Irish Tour. The brothers Denny and Dermot Doherty blend together brilliantly. When you hear Denny sing, it feels like you’re listening to a young Bono and Dermot sounds like he was born to play guitar. 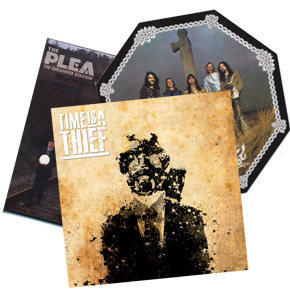 Every few years a band like The Plea catches the public eye and you ask yourself ‘Is this the band?’ – and upon listening to ‘The Dreamers Stadium’, I think it could be. I find myself singing ‘Ah Oh Yay’ and ‘Staggers Anthem’ days after I first heard them. I’ve no doubt in my mind that The Plea are going to be big. I can see them in a few years opening for the likes of Coldplay or even U2. They are a band that everyone should try once. Odds are that you’re going to like them. Open your heart to The Plea. If rock is your thing, then Time Is A Thief are for you. The Foo Fighters-influenced band hit some stunning guitar rifts along with searing vocal melodies and staggeringly good, solid drumming. Despite being together for a relatively short period of time, Time Is A Thief have already played with contemporaries such as Dinosaur Pile-Up, Twin Atlantic and Canterbury. Their debut album, ‘We’re Not Strangers’, has eleven great rock songs that tell tales of revenge, addiction, relationships and ear wigs. Their album title hints that even though they have been around since 2009, this is the first of their material that most people would have heard. All of the band members grew up in Midleton, Co Cork. Jeff, Jimmy and Murf began as a Rage Against the Machine tribute act, whilst in another part of town Adam was belting out numbers with an original band named Citizen Elmo. When Adam left Citizen Elmo, he joined the trio to form Time Is A Thief. They garage-recorded two rough EPs, ‘Conservations’ (2009) and a lighter, more pop-influenced EP called ‘Identity’ in 2010. We’re Not Strangers was meant to be a four-track EP, but the boys’ creative juices must have started to flow, resulting in this brilliant, fast-paced album. That’s right, Horslips are back. The Celtic rock band came out of a 29-year retirement in 2009 and now they have re-released their first album, ‘Happy To Meet...Sorry To Part’, originally released an incredible 40 years ago. They have been described as the founding fathers of Irish rock, and it’s evident to see why. I admit that I don’t know much about Horslips, as they are a couple of decades before my time, but their fusion of traditional Irish music with rock music is genius. The band consists of Jim Lockhart (keyboards, pipes, whistles and flute), Eamon Carr (drums), Charles O’Conner (concertina, mandolin, fiddle, electric guitar, slide guitar and shared lead vocals), Barry Devlin (bass, shared vocals) and Johnny Fean (guitar, banjo, mandolin and harmonica). Happy To Meet...Sorry To Part blends together instrumental songs (‘Happy To Meet’), songs in Irish (‘An Bratách Bán’) and pure Irish rock songs (‘Hall of Mirrors’). This album sums up what Celtic Rock is all about. A good example is ‘Scalloway Ripoff’. It starts in an Irish way, with the tin whistle, but then in comes Eamon Carr on the drums. In saying that, not all songs are rock influenced. ‘Bím Istigh ag ól’ is a good old Irish song with the whistle and the bodhrán. ‘Happy To Meet...Sorry To Part’ is a definite must buy for those people who like a bit of rock or a bit of trad – or both. If you’re part of the older generation, this album will bring back fond memories from your childhood. But if you’re part of the modern generation, like me, and have never heard (or have heard very little) of the Horslips, then you should give it a try. I loved it, and who’s to say you won’t too. Bet they will go down a storm with all ages at the Westport Festival of Music and Performing Arts next month. Joseph Gibbons is a Transition Year Student at Sancta Maria College, Louisburgh.